Tea Party Prankster Robert Erickson Strikes Again! :	Protest at Immigration Office Exposes Racism and Hypocrisy of Deporting Latino Immigrants | Fight Back! Tea Party Prankster Robert Erickson Strikes Again! 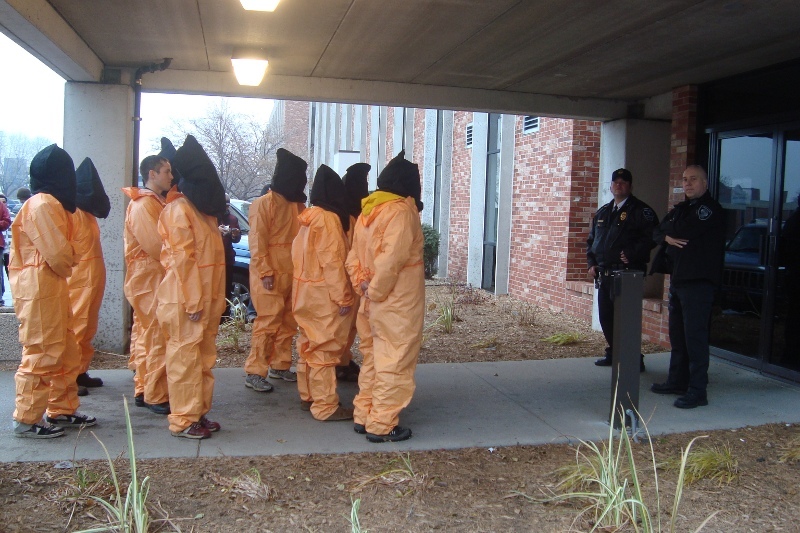 Bloomington, MN - On Monday morning, Nov. 23, a group of immigrant rights activists staged a guerrilla theater-style protest here to dramatically expose the racism and hypocrisy of immigration raids that target Latino immigrants, tearing apart families and communities. 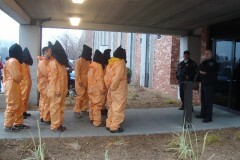 In a striking visual display, nine people dressed as prisoners in orange jumpsuits and black hoods came to the entrance of the Immigration and Customs Enforcement (ICE) building here demanding to be deported. They were accompanied by 25 supporters who also demanded that ICE check their documents and deport them. They claimed to be not undocumented Latino immigrants, but instead European descendants who were admitting that their ancestors had come to this continent illegally and committed genocide against the Native Americans while stealing their lands. Because of this, they demanded that ICE deport them. ICE officials and police officers seemed confused and formed a line blocking the door to the building, so the protesters could not enter to turn themselves in for deportation back to the European countries that their ancestors had immigrated from without documents. The ICE officers present refused to check their documents to see if they were in the country legally. The officers also refused a request for an ICE official to come out to meet with them about the waves of European immigrants who came to the U.S. without the permission of the Native Americans, who then drove the original Americans off their land through countless broken treaties and genocidal wars. When ICE officials refused to let the protesters enter the building to turn themselves in for deportation, the protesters responded by chanted, "Deport us now!" and, "What if we were brown?" This exposed the blatant racism that targets Latino immigrants for deportation in their homes and workplaces, while refusing to even check the documents of white people who show up at ICE's doorstep claiming to be in the country illegally and asking to be deported. The guerrilla theater-style protest was organized by the Minnesota Immigrant Rights Action Coalition (MIRAc). It was a follow-up to a protest organized on Nov. 14, in which MIRAc protested against a right-wing anti-immigrant 'Tea Party' outside the Minnesota State Capitol. At that rally an immigrant rights activist going by the name of Robert Erickson tricked the anti-immigrant organizers into letting him speak at their rally. Instead of denouncing Latino immigrants, he denounced the original European colonizers to this continent that stole the land from Native Americans. At the Nov. 23 action, Robert Erickson spoke again, saying, "[Christopher] Columbus is the original illegal immigrant…he came without papers and didn't ask for permission. Through policies of ethnic cleansing and extermination, the original pilgrims stole this land from the real [Native] Americans, killing more than 30 million [Native] Americans in the worst genocide in human history." Erickson differentiated between the European colonizers who came here for illegitimate reasons to steal land and resources and current immigrants from Central and South America who are forced to leave their countries by U.S.-sponsored wars and economic policies that bankrupt their countries, and come here to be able to simply survive, not to conquer. Erickson said, "Just as the original pilgrims profited from the exploitation and murder of indigenous Americans, modern day pilgrims are reaping massive profits by displacing indigenous Mexicans, Central and South Americans from their rightful homelands through economic conquest." Erickson encouraged people to support the native Dakota people's struggle for sovereignty and to support the rights of Mexican, Central American and South American immigrants.